SCALLYWAGS RESORT GILI TRAWANGAN is an island institution. It’s one of those places where you simply cannot go wrong. Whether you’re staying in the resort, or you’ve dropped in for an impressive spread of fresh seafood BBQ and a pint of Guinness to wash it down with – it’s an unbeatable spot to observe the faces of the island and take in Gili Trawangan’s electric vibe. We were in the party island recently, and managed to get shooed-into the last available room (on rather short notice, it’s a highly sought after joint. Bookings are essential in high season). This is our unbiased review of Scallywags Resort Gili Trawangan. From the boat landing, or rather the designated area on the shore where the fast boats offload eager crowds in the shallow waters hugging their monstrous backpacks and rigid cases – Scallywags is a short 5-minute stroll towards the boat jetty. No horse cart needed, that’s if you’re travelling light. A quick succession of sports bars are signs that you’re close. When you come to a wonderfully shaded verandah over the path that stretches over a breezy restaurant, you’ve arrived. Your thirst is promptly quenched with a welcome drink; two icy bottles of Bintang in the reception bar, that’s dotted with comfy seats and sofas you can sink into and watch the daytime crowds amble by. Rather than getting the urge to explore the island under the heat of the blistering sun, you’ll be quite happy to cool off in the pool. Perhaps another Bintang, please. Resort suites are bright, generously draped with natural light and white starched linen. You might be tempted to sink into the voluptuous bedding and help yourself to an afternoon siesta. Don’t mind if we do. 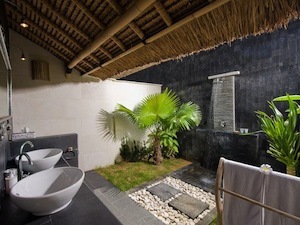 But first, a tropical shower in the outdoor bathroom that’s big enough to cartwheel in. It’s the perfect place to crash out in after a big night out – and to wake up in. In your mini bar, you’ll find packets of Berocca for that banging headache. See, they’ve thought of everything. And while you sleep, you’ll barely hear the faint echo of the island’s thumping nightlife. That’s if you don’t plan on being part it. The open fire grill and spread of fresh seafood is an impressive sight. It makes the other restaurants in Gili Trawangan along the main strip pale in comparison. It’s easy to see why the restaurant packs out every night. The contended hubbub of happy eaters is evidence enough. 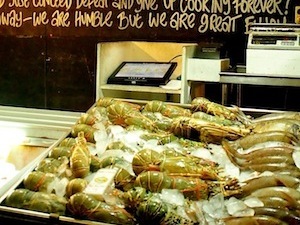 One can easily feast on top quality surf and turf, drink well, and all for little over US$30 per head. Other menu highlights include a selection of tapas, and all the cheeses and olives that you love, and can’t live without. The restaurant seats more people than other restaurants along the main strip, which gives it a nice bustling atmosphere. It’s beach club holiday dining at it’s finest. I couldn’t help but notice that the restaurant is better lit, flooded with a warm and generous glow of amber light. It’s much more welcoming than the flouro glow of cool lights at the other restaurants. What’s up with that? While service can be a little brusque, it’s always efficient – which is more than we can say about service in the Gilis (and Bali) in general. You’re never far from something interesting to eat, drink or do on the island. 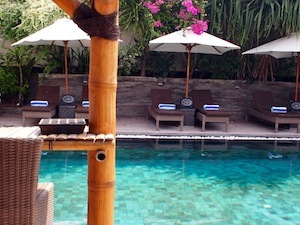 The resort is strategically located in the middle of Gili Trawangan’s round-the-clock action. The main strip of bars, restaurants and popular beachside cafes, including the Art Market near the jetty towards the south side. And the quieter stretch of resorts and beach bars towards sunset point in the other direction. Scallywags throws some of the best beach weddings in the Gilis. In the resort on Gili Trawangan, and their organic arm on Gili Air. They’re cautious however, about warning couples-to-be about the complexities of desert island beach weddings. Sometimes the details aren’t perfect, like the weather and getting specific supplies to the island. This can’t be helped. Sometimes things end up costing more and last minute changes are a no-go. There’s no getting precious about a rigidly ‘perfect’ island wedding. More on that in this article, This could be your Gili island wedding. Scallywags Gili Trawangan has it’s own private boat landing. Which makes shore-to-shore transfers between and Gilis and Lombok a delightful convenience. Splash out to stay in this fancy resort or rough it out in something a little more budget friendly? Definitely splash out. You’re actually getting a pretty sweet deal. Room rates at Scallwags Resort Gili Trawangan sit somewhere between standard air conditioned beach bungalows which start at US$60 a night, and the new boutique resorts charging upwards of US$200 a night. Room rates start at US$120 a night during low season and US$150 during high season, which includes a continental buffet breakfast. Private transfers from Lombok and the other Gili islands can be arranged on request. Visit their website for more info and reservations.